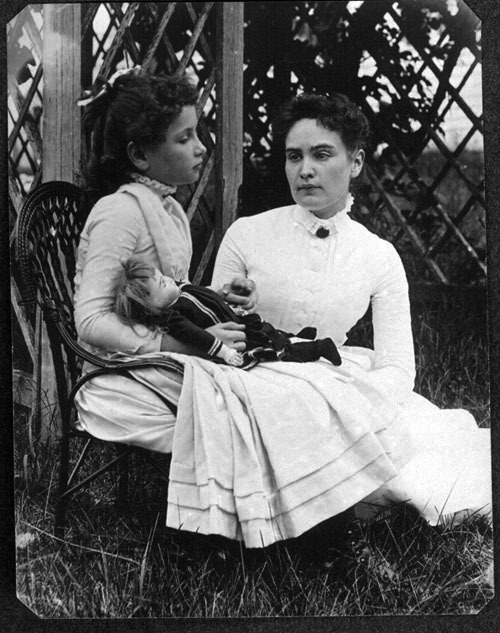 Keller with Anne Sullivan in July, 1888. Sullivan arrived at Keller’s house in March 1887, and immediately began to teach Helen to communicate by spelling words into her hand, beginning with “d-o-l-l” for the doll that she had brought Keller as a present. Keller was frustrated, at first, because she did not understand that every object had a word uniquely identifying it. In 1904, at the age of 24, Keller graduated from Radcliffe, becoming the first deaf blind person to earn a Bachelor of Arts degree. A message of optimism, of hope, of good cheer, and of loving service was brought to Menomonie Saturday—a message that will linger long with those fortunate enough to have received it. This message came with the visit of Helen Keller and her teacher, Mrs. John Macy, and both had a hand in imparting it Saturday evening to a splendid audience that filled The Memorial. The wonderful girl who has so brilliantly triumphed over the triple afflictions of blindness, dumbness and deafness, gave a talk with her own lips on “Happiness,” and it will be remembered always as a piece of inspired teaching by those who heard it. According to those who attended, Helen Keller spoke of the joy that life gave her. She was thankful for the faculties and abilities that she did possess and stated that the most productive pleasures she had were curiosity and imagination. Keller also spoke of the joy of service and the happiness that came from doing things for others … Keller imparted that “helping your fellow men were one’s only excuse for being in this world and in the doing of things to help one’s fellows lay the secret of lasting happiness.” She also told of the joys of loving work and accomplishment and the happiness of achievement. Although the entire lecture lasted only a little over an hour, the lecture had a profound impact on the audience. This entry was posted in Uncategorized on December 22, 2017 by Bix.